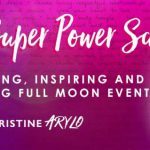 On the Super Full Moon, I held a special Feminine Super Power circle to activate Feminine Wisdom and Power during these uncertain and intense times…to illuminate the path ahead from love instead of fear. I believe we are the ones here at this time to be part of a great awakening on this planet, and awakenings are often not easy. It’s HOW we respond to what is happening in our world, families, communities and systems, whether it’s an election, water and oil rights, the way we do business, how we raise and educate our children, how we come together in true sisterhood or not – that is the deciding factor of how this will unfold. The ancient sages predicted we would come as a people to this time of unrest. Change often requires a catalyst, a bolt of lightening to quicken the shift. But the HOW we get there is not pre-determined. We are the ones who will lead the way. YOU are the one who will lead the way. We each have a part to play. Never diminish or discount the importance of your part, no matter how small it may seem. 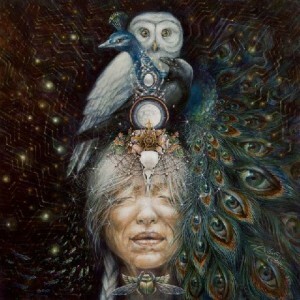 Many sages have said that when the women truly come together the great shift will occur. And while we have made much progress in this way, one only has to turn on reality TV, look at Twitter feeds, look around her own circle of friends and family to see as women we are still divided in many ways. I called this circle in sisterhood. For the hearts of women and girls worldwide. We each have a part to play. Watch the video above, tune in and see what and where to go from here. Christine, What was the name of the Pandora station you referred to in the Full moon Circle? Thank you so much for your message of the full moon circle. I am glad that I once again tuned in to your vibration. It is so important that women like you speak up. Thank you for guiding so many women into the path of self love and self trust. It is from there that we can feel safe to access our part in the wheel of life. First of let me say a gigantic thank you for your book Choosing Me Before We. At 46 years of age this book has brought me answers and lessons that escaped me all of my life. Since I read it in December last year to present I have been on an exciting journey to healing of my holes. Learning to stop being the perpetual fixer and learning to politely decline are the first in the exam paper. I am now tuned into your calling as you get life and you actually get people! You don’t offer a load of information then say if you wanna know more pay for a class or a retreat or the other. You actually offer solutions with everything that I have read or listened to thus far. I now understand the lust that I have for water and the moon 😀 and so much more about myself and life in general. I send you a million and more thank yous and Blessings for your beauty that shines forth through your life giving calling and look forward to being a part of one of your classes/ celebrations soon. Error: Error validating access token: Session has expired on Friday, 19-Apr-19 12:24:14 PDT. The current time is Wednesday, 24-Apr-19 08:57:31 PDT.